* Bright metallic finish. * Conductive - permits welding. * Protects ferrous metals in hostile environments. * For all touch up and repair jobs. * Resists salt spray. 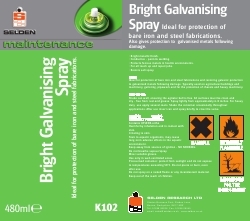 Ideal for protection of bare iron and steel fabrications and restoring galvanic protection to galvanised metals following damage. Typically used on agricultural buildings and machinery, guttering, pipework and for protection of chassis and heavy machinery. Shake can well, ensuring the agitator ball is free. All surfaces must be clean and dry - free from rust and grease. Spray lightly from approximately 6-8 inches. For heavy duty use apply several coats. Shake the container occasionally throughout applications. After use invert can and spray briefly to clear the valve.